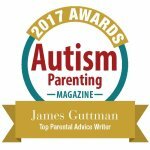 Letting My Son With Autism Build His Own Relationships – Hi Blog! I'm Dad. My non-verbal son and I have a unique connection. I get him and he gets me. From a gesture or expression, I can sense his needs. We require no words to communicate and we work around anything that either of us might not understand. It took years to get into this, albeit imperfect, groove. We’ve had trials and errors that still create confusion to this day. There have been plenty of times where I’ve ordered him to return to his bed for sleep, only to see him clutching an empty cup of water as he slinks away. I apologize, get him a drink, and then beat myself up over it for the rest of the night. Despite those occasional missteps, this process breeds a small bit of arrogance for me. I assume, right or wrong, that I know Lucas better than anyone on Earth. I’m his tour guide to society, his introducer to the room, and anyone who talks to him has me there to explain and translate. In many cases, I’m very needed. Let’s say a friend asks him, “Do you like school?” He can’t answer a question like that. He not only lacks the words, but his devices and hand motions are more for short sentences. Understanding feelings and having deeper discussion aren’t part of his world right now. That’s where I jump in. He likes it. Yeah. He’s doing really well. I smile. They look at me and then back at Lucas. It’s a very strange interaction, but one that I have had lots of times. They want to know how he is doing. So, they ask. If he can’t respond, I respond for him. It makes me happy that they are taking an interest in my son’s life and even happier that they grant him the respect to ask. Those who show Lucas common courtesy like that rank very highly on my list of people. The other edge of that double-sided sword is that I sometimes come running over to be of assistance when no assistance is needed. I jump into a situation and try to micromanage his interactions before they even begin. I’m conscious of that and, although I can chalk it up to my need to protect him, I am aware that I need to work on it. It goes back to his toddling years. We had all noticed delays here and there. He wasn’t doing most of the parlor tricks that babies tend to do. There was no peek-a-boo, no wheels on the bus, and no high fives. The older he became, the more the light shined on his missed performances. It was never more apparent than when we’d have visitors come walking in the front door with an extended palm. They’d want him to give them five or shake their hand. Lucas, however, was too busy trying to see his reflection in the glass of our china cabinet. Inevitably, the high fiver was left hanging and I would get a painful ball in the pit of my stomach. I felt like my son had failed this person and I, the powerless observer, had failed my son. It was lots of failure to process surrounding a simple greeting. The visit hadn’t even begun and I was already dealing with mental anguish. I hated that feeling and, to this day, I sometimes overcompensate to make sure these scenarios don’t repeat. I instinctively run over and wedge myself into the encounter. After all, it took years for me to develop this unspoken bond with him. I can’t expect everyone to have the same thing, right? The problem with that, though, is that I find myself flocking to all his relationships. It’s not just acquaintances and family friends. I also do it with people who know him best, like his sister. Then, she’ll run around in circles like a nutcase. Half the time, he eagerly dashes off after her. The other half, he will walk away and leave her spinning through the dining room. She invented this game and its fifty percent success rate is still better than most games we play with him. I want nothing more than for him to join the fun. Visions of her impending disappointment run through my head. I do everything in my power to prevent that from happening. I cheer my way through the game and try to oversell how exciting it all is. Anytime he gets close to her, purposeful or otherwise, I will l scream out, “Uh oh! He’s coming to get you!” Olivia and I both laugh and holler, sometimes tickling him as we do. Chuckles are exchanged. Pictures are snapped. We have a grand old time. That feeling of concern for my boy stretches across the spectrum of relationships in his life. I don’t want people to find him too difficult to get through to, give up on him, or see him differently than how I see him. It’s why my stomach gets knots. It’s why I come running. As he gets older, though, my presence isn’t as needed as it once was. I realized this yesterday when, as Olivia was trying to get him to play dining room tag, I tried to coax him into caring. Out of nowhere, my daughter took my hand, lead me to my home office, and closed the door behind me. I stood alone in the room as she went to play with her brother. When I came out a few minutes later, I saw them sitting on the couch together watching television. They looked like siblings and they looked happy. Could I have found something more fun for them to do? Probably. Would I have wanted to be a part of their fun time? Sure. This wasn’t about me, though. This was about them and the relationship that they shared. I had to let go of that control. I had to let them be them. I know that, in a vast number of cases, I’m needed. My presence in Lucas’s life is important and, in many of his relationships, I will play a pivotal role in allowing the world to understand him and helping him understand the world. There will most likely always be activities he can’t take part in without his dad there to act as a go-between. To make him a complete person, though, I can’t be that person all the time. Those years of training him for the world was for a reason. He needs to create his own relationships too, not just the ones that his father tries to make perfect. Sure, he might leave a few high fives hanging or ignore a question or two, but that’s what having your own life is all about. It’s my job to let him live it. Next How Can I Raise A Child With Autism?